With spring right around the corner, we're in a time of transformation. So, it seems like a fitting time to discuss another kind of transformation -- transformation of Gibson Assembly® constructs. As all researchers know, transformation is a critical step in all cloning and assembly reactions. Here, we’d like to take a moment to address some of the ways you can maximize success. Since Gibson Assembly® cloning has the capability to assemble multiple fragments simultaneously resulting in complex assemblies, it is especially important to use high efficiency competent cells for transformation. Electroporation yields high transformation efficiencies, and it is often the preferred method for labs carrying out the most complex assembly reactions. For labs that do not have access to electroporation equipment or for more routine assemblies, transformation with high efficiency chemically competent cells can also be used with success. 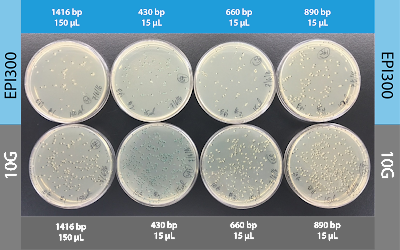 As shown in the image above, we achieve cloning efficiencies of over 90% when assembling 2, 5, or 6 fragments with the Gibson Assembly Ultra kit, followed by electroporation into TransforMax™ EPI300™ Electrocompetent E. coli (Epicentre® Cat. No. EC300110). We have a long history of performing electroporation with EPI300 cells, and they offer a useful advantage of compatibility with large, inducible clones. But what about other transformation options? We have previously demonstrated that Gibson Assembly constructs can be successfully transformed into a wide variety of competent cells. The results of those studies can be found in the Application Note “Gibson Assembly® HiFi 1 Step and Ultra Kits are Compatible with Multiple Electrocompetent and Chemically Competent Cells”. A list of the different types of competent cells, their respective transformation conditions, and observed transformation efficiencies is shown in the following table. 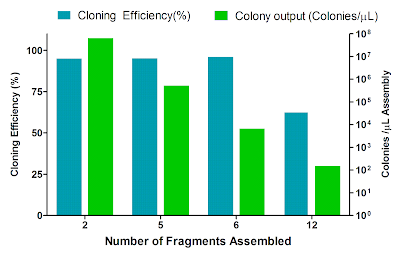 As you can see, Gibson Assembly® cloning is compatible with a wide range of competent cells, yielding baseline transformation efficiencies in the 108 and 109 range. Recently, we performed a side-by-side transformation comparison using EPI300™ cells and chemically competent E. cloni® 10G cells (Lucigen Cat. No. 60107). The results of that study can be found in an Application Note entitled “High-efficiency, low-cost transformation of Gibson Assembly constructs”. In that study, we showed that 10G cells offer a low-cost alternative for high efficiency transformation, yielding more transformants with 10G chemical transformation than EPI300™ electroporation. Gibson Assembly constructs can be successfully transformed into a wide variety of competent cells. For detailed protocols, please refer to our Gibson Assembly® HiFi 1-Step or Ultra User Guides and Application Notes. Learn more about Gibson Assembly products at sgidna.com. Corporate events have become essential in today's world. Organizing such corporate events NYC include numbers of things like finding the right space for the events and planning activities which helps in achieving the organization's goals.